The plaster machine station SHS--4/6 it is applied to reception of a commodity solution, its finishing up to a necessary working consistence, filtering and submission to plasterer workplaces for drawing on plastered surfaces, filling floors and drawing on vertical plastered surfaces by injectors. 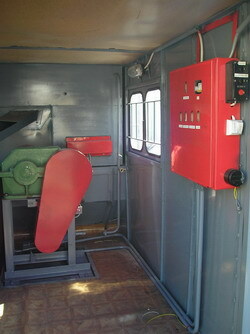 The station represents the warmed van in which the reception bunker, elevating wheel with the mechanism of rotation, a water tank with the centrifugal pump, mortar pump, the bunker with vibrocleaner, system of heating, an electric equipment are located. The station is applied on the open areas of units of industrial, civil and farm construction provided by the electric power and water. Climatic modification V category I in accordance with GOST 15150 at an ambient temperature from a minus 30°С up to plus 40°С. At negative temperature of external air by the consumer should be provided reliable heat insulation of mortar (concrete) wire and systems of water supply. The minimal set of plaster different diameter hoses enters into a base complete together with station, and also a set of adapters, injectors, rubber plate. 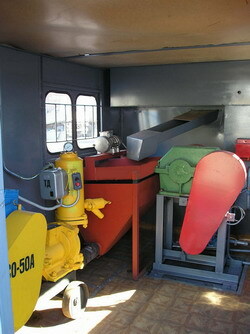 Convenient van for service of the equipment. The dimensions convenient for transportation. The minimal weight at the maximal productivity. Strengthened elevating wheel (there is no necessity in double-elevating wheel) - more cheaply, more reliably! Warming of the reception bunker by a profile water shirt (no leaks) - « as a heater » (the solution will not cool down at low temperatures at included thermopile - a tank with water). 2 supporting shaft increasing service life of supporting bearings. The opportunity of use of frictionless bearing instead of slider bearing (under the order) - increases service life. Maintainability of a supporting shaft. Shock-proof bar - indemnification of impact of a board of a dumper about the reception bunker. Details from welding steel - maintainability, reliability, quality. Work at low temperatures - thermopile - a warmed up tank with water.